Many herbs may help slow your heart rate. According to MedlinePlus, your heart rate, or pulse, is the number of times your heart beats in one minute while you are at rest. Numerous factors can affect your resting heart rate, including your fitness level, your age and your health status. Before taking herbs to help slow your heart rate, talk with your doctor about possible side effects, proper dosage and potential drug interactions. Dong quai, also known as Angelica sinensis, is an herbal remedy that may help decrease your heart rate. According to the University of Maryland Medical Center, dong quai, a member of the parsley family, has been used for centuries as a spice, tonic and medicine in China, Korea and Japan, where it grows at high altitudes in cold, damp and mountainous terrains. Dong quai has a sweet, bitter and slightly pungent taste as well as warming and moistening tendencies. The root of the plant is used for medicinal purposes. Dr. Sharol Tilgner, a naturopathic physician and author of the book "Herbal Medicine From the Heart of the Earth," states that dong quai is a sedative that strengthens your heart contractility while decreasing the rate of contractions and it helps decrease hypertension, or elevated blood pressure, over time. Meet with your doctor to discuss appropriate dosage, possible side effects and potential drug interactions before taking dong quai to help lower your heart rate. Skullcap is an herb that may lower your heart rate. Botanical.com states that skullcap, also known as Scutellaria lateriflora, is an herbaceous, perennial plant that grows to a maximum height of about 4 feet. Skullcap, a member of the mint family, has a bitter taste, possesses cooling tendencies and has been used in both Eastern and Western healing traditions to help treat numerous health problems. The aerial herb in bud is used medicinally. According to Ed Smith, an herbalist and author of the book "Therapeutic Herb Manual," skullcap is a sedative, antispasmodic and hypotensive that has been used to help treat nervous heart disorders, nervous exhaustion and anxiety. Because skullcap is a sedative, it may help reduce anxiety-related health problems, including elevated resting heart rate. Consult your physician about proper dosage, potential side effects and possible drug interactions before taking skullcap to help lower your heart rate. Lemon balm, also called Melissa officinalis, is an herb that may effectively reduce your heart rate. According to the University of Maryland Medical Center, lemon balm, a member of the mint family, is a plant native to Europe that now grows throughout the world. 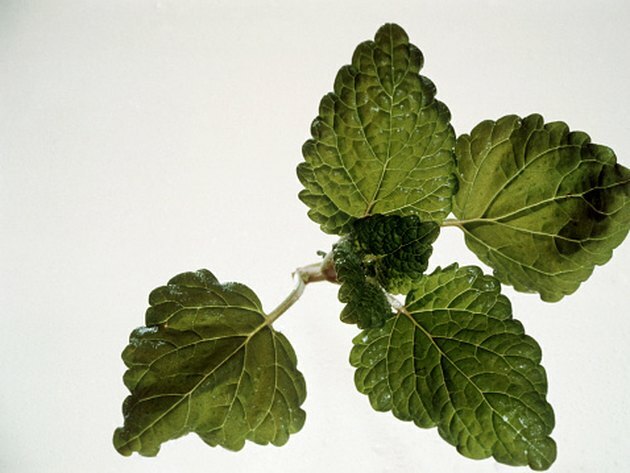 Lemon balm has a sweet, sour and lemon-like taste and possesses slightly warming tendencies. The leaves of the plant, which contain terpenes, are used to help treat health problems, including elevated heart rate. Tlgner states that lemon balm is a nervine, sedative, antidepressant, antispasmodic and vasodilating hypotensive, or a substance that reduces the burden and stress on your cardiovascular system. Stress-related elevations in heart rate may respond particularly well to lemon balm. Before taking lemon balm to help treat your elevated heart rate, talk with your physician about possible side effects, proper dosage and potential drug interactions.